There are 43 posts filed in apple (this is page 2 of 3). you might have heard it: apple is releasing tiger, their new flavour of os x. but now mike bombich noted (in this discussion) that the marvellous carbon copy cloner, a tool i use often now and then to back up my data does not work with tiger. the folks over at tuaw.com say it like so: “Consider my pre-Tiger buzz officially killed”. yesterday i went to prolong my contract with my mobile phone provider, so i was able to cheaply get a new mobile phone. after looking at the different mobiles compatible with isync i decided (mostly for monetary reasons) to get the Sony Ericsson K700i. after trying to sync it with my computer i nearly gave up, because isync always crashed on me in the middle of the syncing process. after countless tries, deleting preference files, rewriting some preinstalled bundles and stuff like that isync notified me of a “duplication warning” with one contact i have in my address-book: the godfather of my sister is in my address book as: Renner Prename & Prename Wife. that puny little ampersand made my isync crash every time. after i’ve edited the contact to “Renner Prename1 Prename2” everything worked like a charm. now i just need to get file transfers going, that’s also a thing that doesn’t work. the transfer starts just right, but then dies with the error seen on the left. 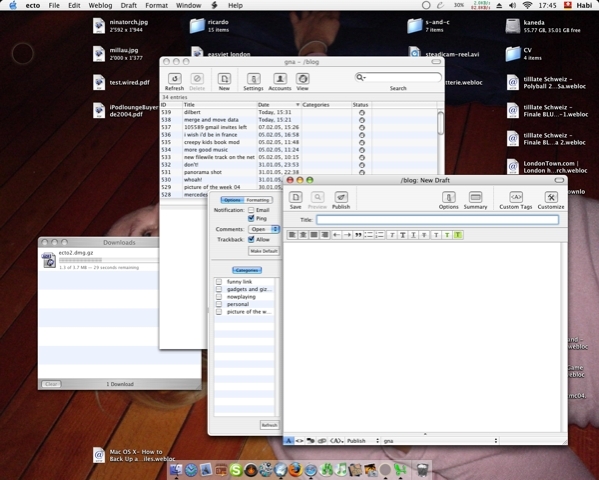 i can send files from the phone to the mac, but not the other way. really weird! (btw: from left to right: bluephoneelite, meteorologist, os x’ bluetooth status, os x’ eject, os x’ airport (off), menu meters cpu, menu meters network, os x’ clock). the newest revision of apples powerbooks features an accelerometer, that detects if you drop the powerbook and parks the hard disc heads (a thing already found on older ibm-machines). now a guy figured out how to tap into the accelerometer and use it to display all kind of funky stuff (e.g. a window is fixed in space, while the powerbook rotates). 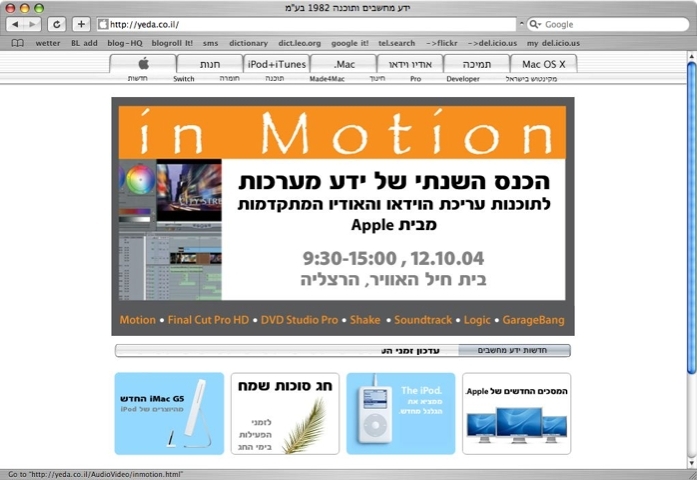 this led another guy to program a python script whith which you can control itunes. just give your powerbook a mild slap on the head and it switches to the next song. i see some really funky stuff coming up for those powerbooks…. update: someone already did program a game for the tilt sensors. let the fun begin. seems like this document over at apple was pretty good. after i’ve moved 15gb of data everything seems to work… this is posted from my new computer…. la fille de zürich posted a list of all the songs that forbid you to do stuff. in the image on the left you can see a list of my don’ts. (it’s a screenshot from itunes, because i can’t fit all songs on my ipod). what are the don’ts in your playlist? i just bought a power mac :-) i’ve been bidding on it, because i thought, that’s such a cheap prize that i’m never gonna win and was not really inclined to buy it. ah, well then, so i’ll replace my ibook with something more suited to my needs… and because i’m gonna get more money than i thought from teaching last week (the school didn’t know about my master degree) i can afford it. the powerbook blog linked to a nice hint on macosxhints.ch (features german translations of osxhints.com, but also original german hints). you might have seen that you can click on any label in a contacts detail (e.g. work address, telephone, etc) to get a nice menu to do things with the data (get it in huge letters all over your screen, look for the map, print label, etc.). so, to use the script, just open script editor, paste the code above (or FAR better, just click here1), save as “script” in ~/Library/Address Book Plug-Ins/ restart your address book and have fun with the address label. oh, and i forgot to mention: the whole thing only works for os x.3! 1that link took me ages! i should have read that post before the suicmc04 was over! i’ve been doing lot of emailing from all the different accounts @suicmc04.ch (info, sponsoring, race, helfer, etc.) and every-time i did this, i did an apple+; to go to the preferences of mail.app to be able change the corresponding email-address. now justin french (with a wonderful website!) mentions an un-documented feature of mail.app. you are able to set up multiple adresses for one account, which is a HUGE timesaver for all of you that have multiple mail-addresses that are being forwarded to one address in the end (e.g john@example.com, john.doe@example.com, info@example.com). mail.app is even smart enough to know which address to use when you reply to an incoming mail. just wonderful, but a pity i know it now that the suicmc is over and i won’t be handling multi-alias mailing anytime soon. stuff like this makes working with a mac even more fun! [via 43 folders] a blog chock-full of other very useful tricks and hacks! i seem to be chewing up posts from other blogs tonight, but this is just too cool. leo links to the newest hit by apple, the smallest sibling of all airport basestations, the airport express which includes a nice little must-have feature: airtunes. connect the airport express to any outlet in the reach of your wifi-connection. plug in your stereo (or any set of powered speakers, which is really cool) and you can listen easily to all your tunes in any room where your wifi connection goes. 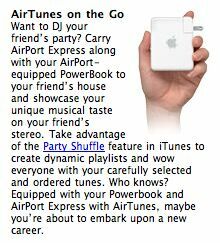 or if you want to be the cool dj on your friends next party take your apple computer equipped with an airport card and your airport express, connect to his stereo and rock on! oh, and just for fun, the airport express includes an ethernet port and a printer port, so besides being cool and stuff, it’s also useful for basestation-stuff and alike. there’s always quite a bit of rumor that sony and apple might teamup sometimes (or the one is buying the other). from the perspective as a gadget-lover this would result in the most technically advanced (sony) gadgets which are on top of the industrial design scale (apple). here’s another evidence that both companies share the same views: if you look at the promotional pictures of sony’s latest hot gadget, the librie they seem to be shot by the same photographer that also does the promotional pictures for apple. the librie seems to float in front of a white surface, with a subtle shadow, shot from a slight frog perspective. just imagine going on a holiday trip an not needing to carry those seven books with you, but just carry that sleek little gadget. a) while looking up some links for the post here i found an excellent mac-centric blog which is now on my rss-wachlist fscklog.typepad.com. b) for all those that still do not get the whole buzz behind rss, the current wired features an excellent little article about what it is. for those appleheads which heavily rely on rss-feeds apples new rss-feeds-page is something long awaited come true. i will install panther now. i won’t do an update of my 10.2 system to panther but try to do a squeaky-clean and fresh install. i know that this is much more work, but in the past one-and-a-half year i own my ibook i’ve installed (and deleted) so many programs that left junk on my HD i don’t want to take with me any further. and if everything fails, i’m just gonna watch raging bull on arte tonight. well the new ipod mini really is mini! i’m 17.79 ipods tall, how about you?